Quartz crystal oscillators and silicon MEMS oscillators used for timing references show an extreme unwanted sensitivity to temperature varation. 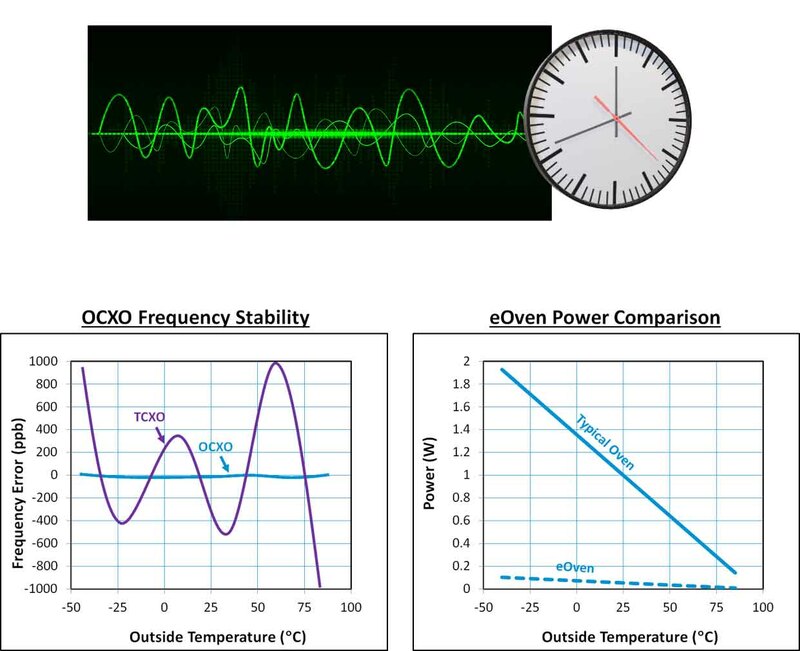 The left-hand plot on the left of this page shows a comparison between a typical temperature-compensated crystal oscillator (TCXO) and an oven-controlled crystal oscillator (OCXO). As illustrated OCXOs typically achieve orders-of-magnitude lower frequency error with outside temperature changes at °10 ppb over a -40 to 85°C. This is achieved with a heater built into the oscillator that holds the device at a constant temperature, independent of the outside temperature. As illustrated in the right-hand plot, typical OCXOs consume large amounts of power as the outside temperature falls (~1W at room temperature and ~2W at -40°C). As illustrated by the dotted line in the right-hand plot, a product with the Epack eOven built-in reduces power consumption by a factor of 20 (~50mW at room temperature and ~100mW at -40°C). This can be even lower for small quartz crystals and Si MEMS oscillators.